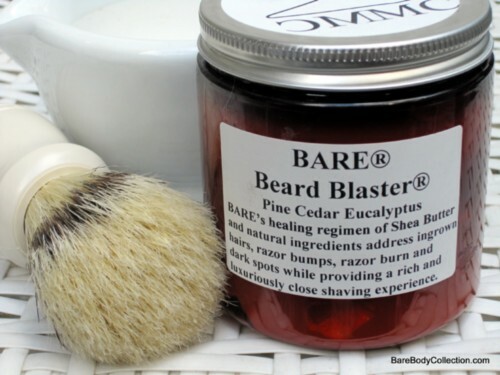 BARE "BEARD BLASTER" Foaming Shaving Cream Skin Type: For All Skin Types An aromatic and refreshing shaving cream for wet shaving that leaves the skin smooth and refreshingly fragrant. Gentle on the skin and the best foaming shaving base for leaving a clean, soft and moisturized feel to the skin. Bright white color and easy to use! Paraben Free. pH: 6-6.5 This cream can be used sparingly and creates a rich creamy lather for a soothing and comfortable shave. How To Use: Lather up a dab of shave cream with your fingers. Apply lather on the face and shave with the grain. For a closer shave, re-lather and shave lightly across or against the grain. Rinse with cold water and apply BARE "DASHING" or "DARING" After Shave! Glycerin, Water, Sodium Cocoyl Isethionate, Sorbitol, Propylene glycol, Disodium Lauryl sulfosuccinate, Stearic Acid, Sodium Chloride, Diazolidinyl Urea (and) Iodopropynyl Butylcarbamate, Tetrasodium EDTA, pine, and eucalyptus essential oil. I would call this "Supreme Cream"! This is the best shave I have ever had with or without water!